PERRY TOWNSHIP, Ohio – Sept. 5th 2018 – The Perry Township Board of Trustees are hosting a Cyber Security educational event for businesses, organizations, government entities, and civic groups. As technology advances, the Perry Township Board of Trustees has recognized a growing need for educational events about Cyber Security. It’s important for business owners – and their customers – that all information is kept confidential. 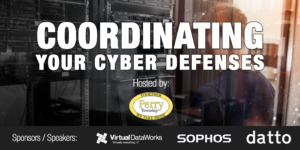 Perry Township and Virtual DataWorks, a local IT Consultant and Managed Services Provider, will be presenting information geared to help businesses coordinate their cyber defenses. Not only are they able to recommend the best technology in the industry, they will be bringing their partners along to discuss the common components of Cyber Security and put your cyber concerns to rest. The event location is Exploration Gateway located at 5712 12th Street Northwest, Canton, Ohio 44708 on Thursday, September 20th, 2018 from 9:00AM-11:30AM. The event will include presentations from Matthew DeWees of Virtual DataWorks and representatives from Datto and Sophos, two of the leading Cyber Security products for businesses. If your business uses any kind of technology, this event is important to your security. The Perry Township Administration looks forward to this educational and informational event for all businesses in the community. Registration can be found at https://www.eventbrite.com/e/coordinating-your-cyber-defenses-registration-48911850662. Perry Township is one of the seventeen townships of Stark County, Ohio. It is an urban township with a population of approximately 28,700 people. The township is led by a Board of Trustees, who work diligently and collaborate efforts which are in the best interest of the community.